Apple has just made available for download iOS 10 beta 5, macOS Sierra beta 5, watchOS 3 beta 5, and tvOS 10 beta 5 for registered developers of Apple Developer Program. The release comes only a week after Apple seeded beta 4 of iOS 10 for iPhone, iPad and iPod touch devices, watchOS 3 for Apple Watch, tvOS 10 for Apple TV 4, and macOS Sierra for Macs to both developers and public beta testers, making beta 5 seed the first release in this cycle to come only a week after previous seed instead of the usual two weeks period. The fifth developer seed in iOS 10 beta cycle can be installed right now using either the over-the-air (OTA) update mechanism found on-device in Settings > General > Software Update, or through an iTunes restore by downloading an IPSW file from developer.apple.com. As for what’s new in this release, we are in the process of installing it on our devices right now and will update accordingly once we find any new changes worthy of reporting. Given that this is a beta 5 seed released near to iPhone 7 launch in just few weeks from now, we don’t expect many changes in this version compared to last one. iOS 10 is likely pretty much done at this point. While iOS 10 beta 5 isn’t available as yet to public beta testers, it’s only a matter of time before Apple makes it available to download for those registered on Apple Beta Software Program. We’ll let you know whenever that happens. Like iOS 10, Apple is likely to finalize macOS Sierra soon, which probably means beta 5 is nothing more than a bug fix and performance optimizer compared to beta 4 before it. Those of you enrolled in Apple Developer Program can head to Mac App Store right now to download the update. watchOS 3 beta 5 for Apple Watch is now available to download as well. While watchOS 3 brings a number of new features to give a new lease of life to the aging first-generation Apple Watch, beta 5 seed brings more under-the-hood performance enhancements than anything else before the final rollout to general public sometime next month. 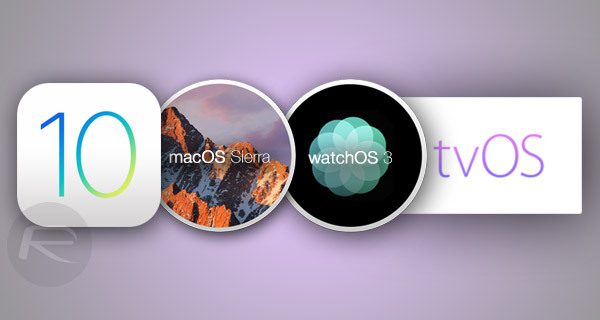 Like iOS 10, macOS Sierra, and watchOS 3 before it, tvOS 10 for Apple TV too is in final stages before the GM release in September, followed by a public release sometime later in the same month. As such, beta 5 is more of a bug fix release than anything else to iron out any showstopper bugs before the final public rollout of the OS to everyone this fall. Update x1: Here’s what is new in iOS 10 beta 5: New Features & Changes In iOS 10 Beta 5 / Public Beta 4. Update x2: iOS 10 public beta 4 and macOS Sierra public beta 4 are now available to download as well.